I’m a Goodreads fan of several authors–real ones, who have book releases. 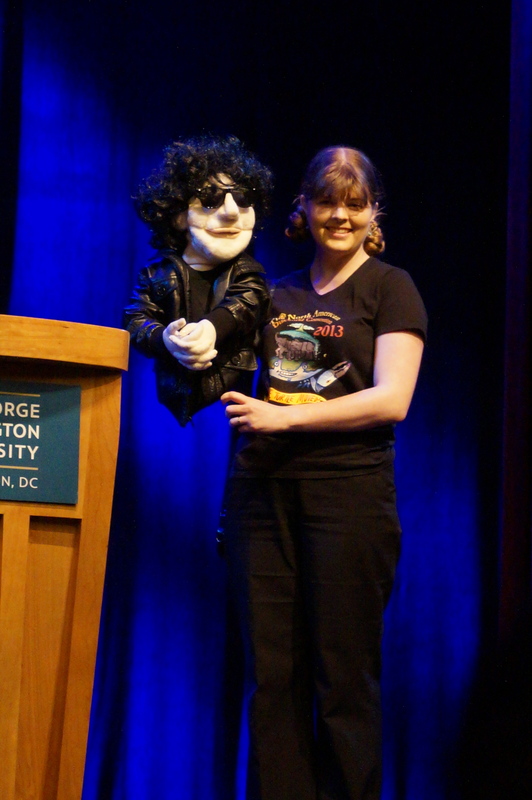 Back in May I read a post by Neil Gaiman announcing he had several upcoming book tours, and there were still 100 tickets left for the Washington DC one! Thrilled, I jumped in and got a spot. 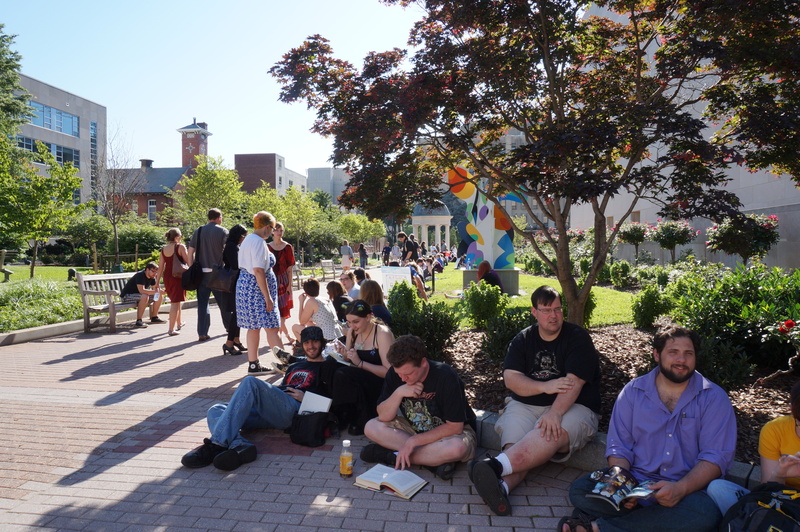 I journeyed downtown to take my place in the very long first-come-first-served line and began a wait to enter Lisner Auditorium and get my book. 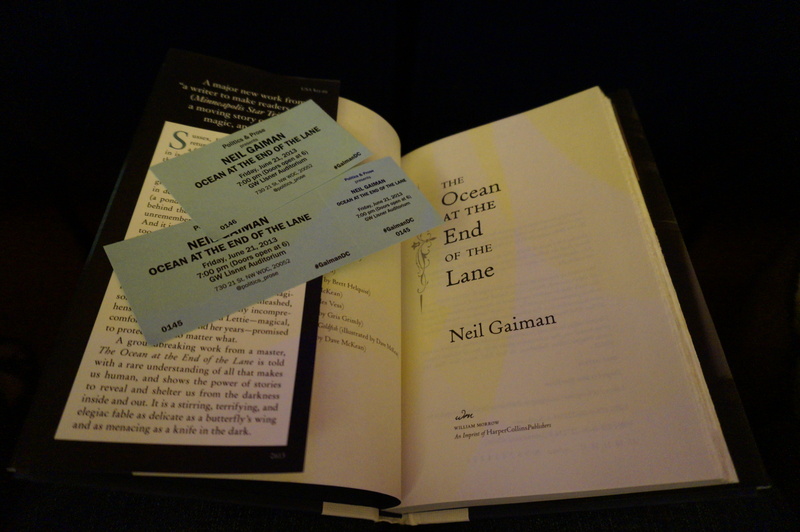 If you’ve never done this, there is always more waiting than actual event, but that’s how it goes when you are famous, and you promise to sign each and every copy of The Ocean at the End of the Lane. 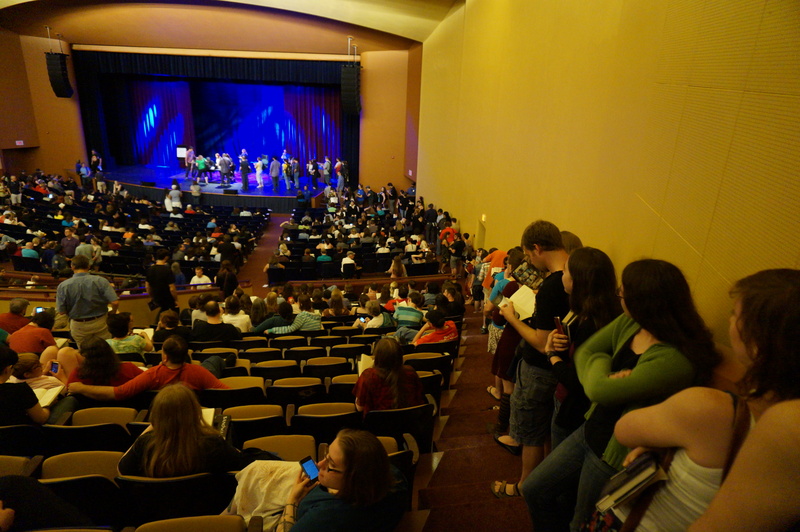 1500 enthusiastic readers cram your event. 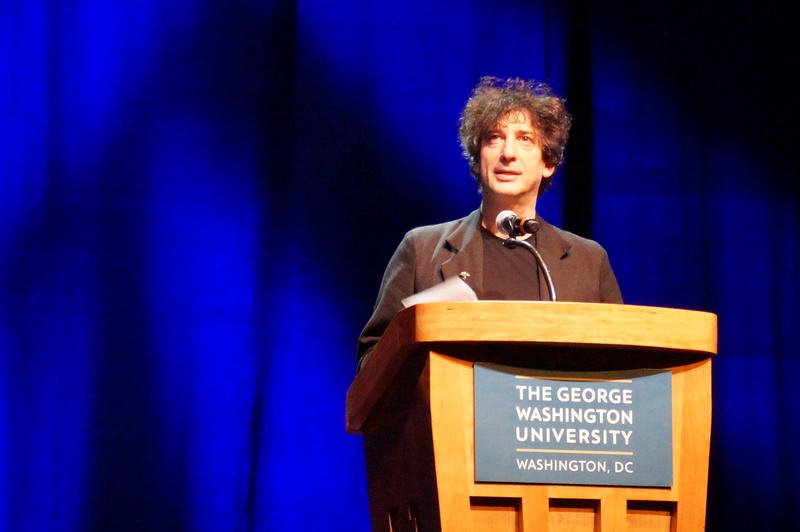 It’s exciting, clearly tiring for the author who pulls it off with calm charm for days in a row –we’re his 9th stop on the England and US tour–and yet I still sigh watching him and hope that one day I may be in his shoes. 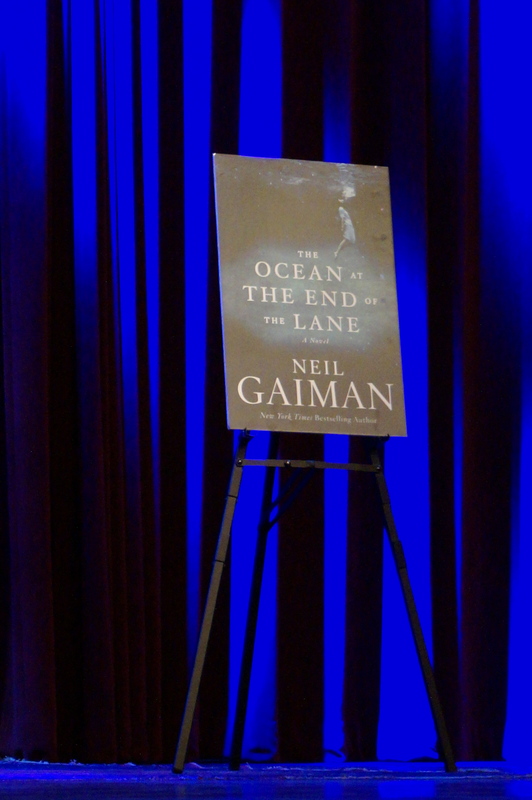 Neil relays how this book is an accident. He intended to write a story for his wife, away recording new music, who he misses very much. She doesn’t really get fantasy writing, so he decides to pen a story for her about the things she does like: him, honesty and feelings. The short story morphs into a novella and then–hooray!–his first adult novel in eight years. 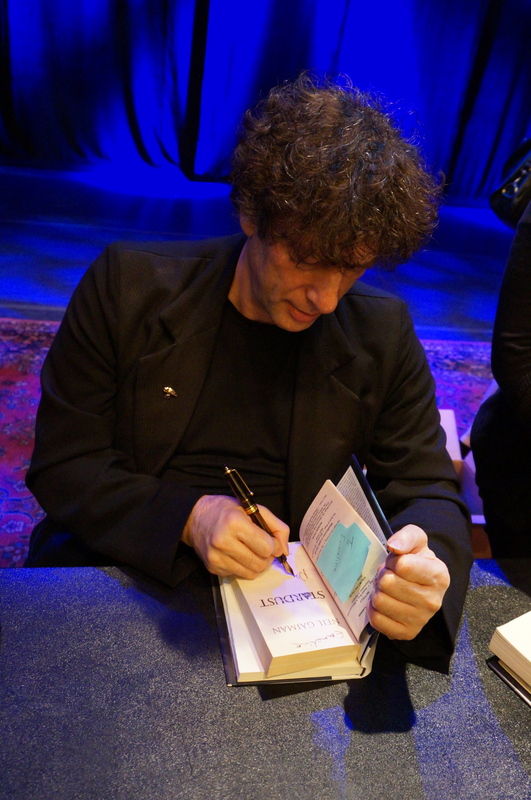 He writes with a fountain pen, in a notebook, completes the novel, then types it up. As he does so, each night he reads to his wife Amanda the portion he has typed that day. And he reads to us, chapter four, because he’s now bored with reading chapter one. 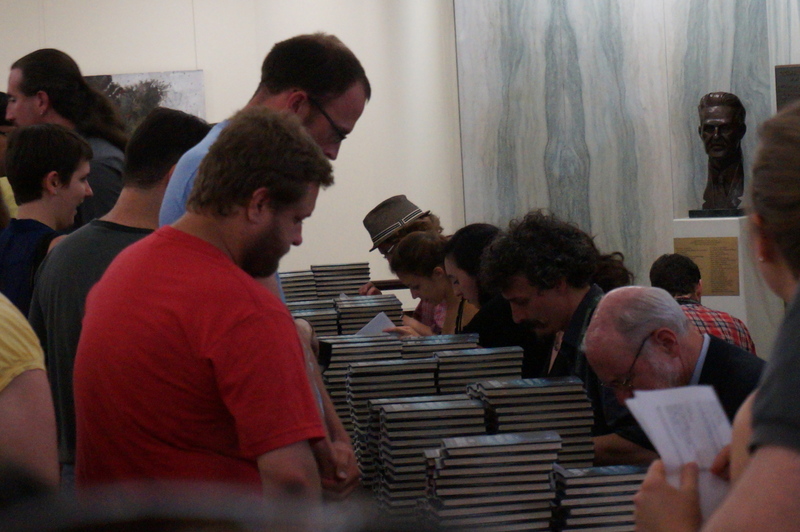 A few more stories, questions, and another brief reading and we are called by groups to line up for the signing. Did I mention there are 1500 of us? 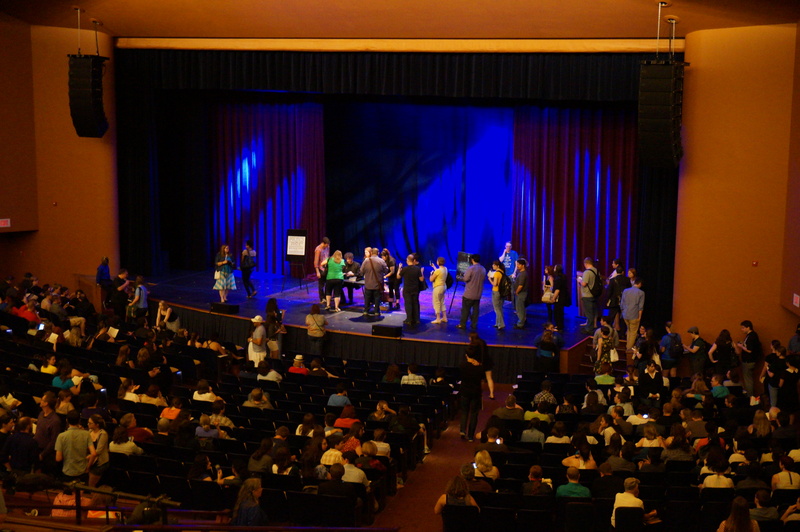 Fortunately I am in the third group, and though I’ve had great views and photos from my fourth row seat, I cannot resist snapping more before I must walk to the top of the auditorium to get in line, then down again. 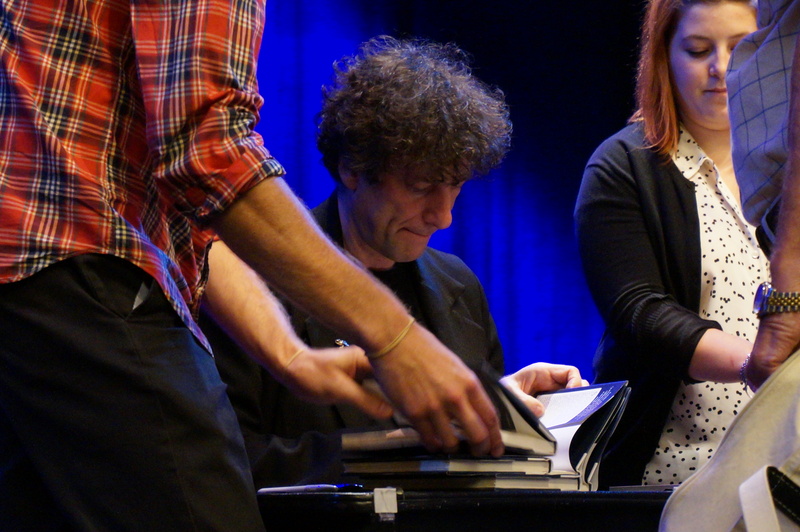 Up on the stage, moving surprisingly fast, I’m finally to the table and for all of 20 seconds, I stand in front of Neil Gaiman while he signs my two allowed books. There are no huge revelations gained over the evening, no words of wisdom that will change how or what I write. 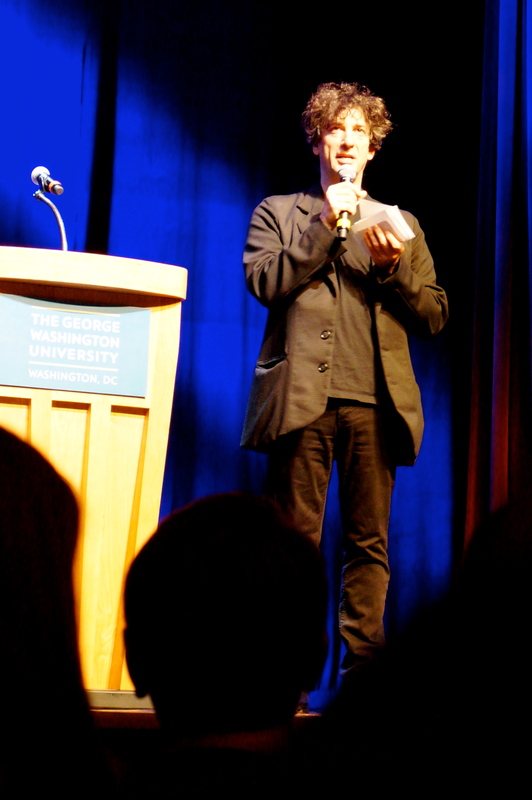 It is simply a nice event, an opportunity to mingle with other fans and be happily in awe in the presence of someone who creates incredibly great stories. 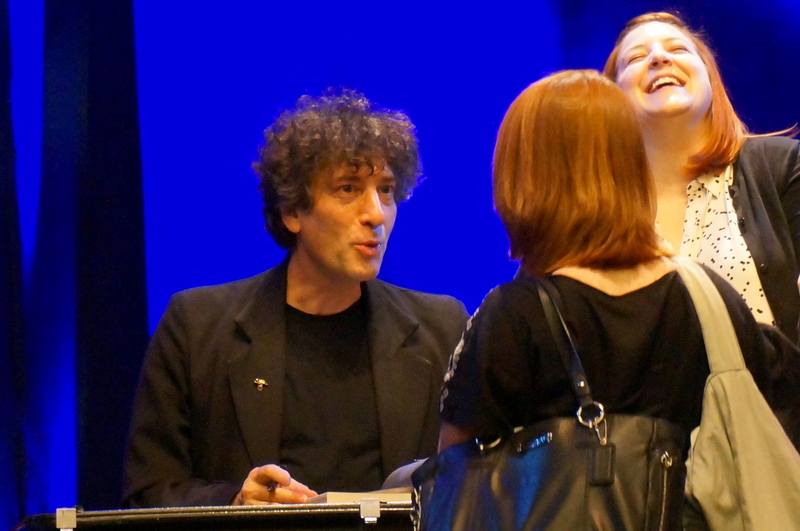 Tags: book signing, Neil Gaiman, Politics and Prose, The Ocean at the End of the Lane. I haven’t totally fallen off the face of the Earth, just fallen behind. Without connecting to a writing group, here’s a snippet from my WIP, a steampunk fantasy romance targeted at the 18+ New Adult audience. The working title is The Farm. Today I’m sharing an early point when the heroine, Annmar leaves her home in the city to take a new job. She will be doing advertising for a large ‘collective’ farm in a rural location called Blighted Basin. With a blast of steam and a jerk, the five-thirty a.m. train to Gaptown pulled out of Glenwood-on-Tyne’s station. Annmar heaved a sigh of relief. Worrying that someone would stop her was ludicrous, but… She’d been most careful, confiding only in Polly. The glow on the eastern horizon hinted at dawn as the train crossed the misty fields of the outlying farms. An unusually large grouping of five barns and three silos caught her eye, and she knew the spread belonged to Shearing Enterprises even before she found his logo on the tallest silo. So she wasn’t past his reaches yet. Annmar hadn’t told Mrs. Rennet about the new job, just gave her notice at the end of the day. Mr. Shearing would try to wheedle her destination from the shopkeeper, who unfortunately would do anything for a price. On the way to the boarding house, she made one stop to purchase the half-dozen sketchbooks she needed in case she stayed the winter. The ‘hinterlands’, as Polly called Blighted Basin, might not sell fine paper, so why not get them now that she had the money to do it? The brown-paper wrapped package went into her trunk, along with her few reminders of her home with Mother. Additional excerpts are posted under my novels, and linked here. Thanks for reading!